Northern flickers (Colaptes auratus) are sizable woodpeckers who are prevalent throughout North America. When it comes time to nest, they usually bore openings in trees. If you want to lure flickers into using a box in your yard, the goal is to make it resemble a nest in a lifeless tree. Getting flickers to use nest boxes usually isn't a hard task. Nest boxes constructed out of sturdy cedar often work well for flickers. Pine can be effective, too, but isn't usually as durable. Acquire a slab of cedar in a rough cut. Size-wise, boxes with floors that are 7 by 7 inches usually work well. The boxes should be between 16 inches and 2 feet tall from the inside. Join the sides of the boxes together using either galvanized nails or wood screws. Nesting holes are also vital additions to the boxes. Make sure you create an opening with a diameter of 2 1/2 inches. Employ wire to ensure that the box remains closed. Give flickers the impression that your nest box is inside of a decaying tree by putting sawdust inside of it. If a flicker comes across your nest box, she'll begin at the small opening and do away with the sawdust until she establishes a cozy hollow for herself. Note that flickers of both genders participate in excavation. The job of tracking down an appropriate nest spot, however, is usually up to the fathers-to-be. Sawdust is a crucial component to setting up a suitable nest box for flickers, as excavation is an important element of these birds' wooing activities. The more sawdust in the nest box, the better. The presence of sawdust also often discourages other birds -- think starlings and sparrows -- from using the nest boxes. If you have the option, affix the nest box to a tall tree. Make sure to do this anywhere between 6 and 30 feet off the ground. Lean the upper portion of the box slightly to the front -- think roughly 15 degrees. Doing this might help the flickers in feeding their chicks. If you reside in a colder geographic location, face the front of the nest box south. If you reside in a warmer locale, face it to the north. 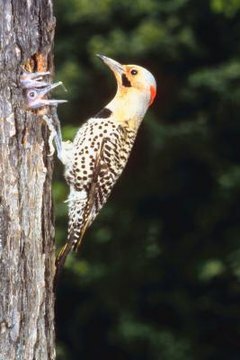 Although northern flickers often readily make use of nest boxes created by humans, they're frequently found nesting in other locations, as well. These include old phone poles, the exteriors of residences and gateposts. If a pair of flickers takes it upon themselves to nest on the outer walls of your home, it might be a good idea to assist them by building boxes. Flickers in nest mode tend to be highly protective of their turf. They often work hard to drive fellow flickers away.